Chlorophyll prints were made by students in Greeley Hill Elementary and Lake Don Pedro Elementary during Cara Goger’s residency. Students used images taken by Lewis W. Hine (who advocated for the rights of children by documenting child labor in the 19th Century) and used a technique developed by Binh Danh. 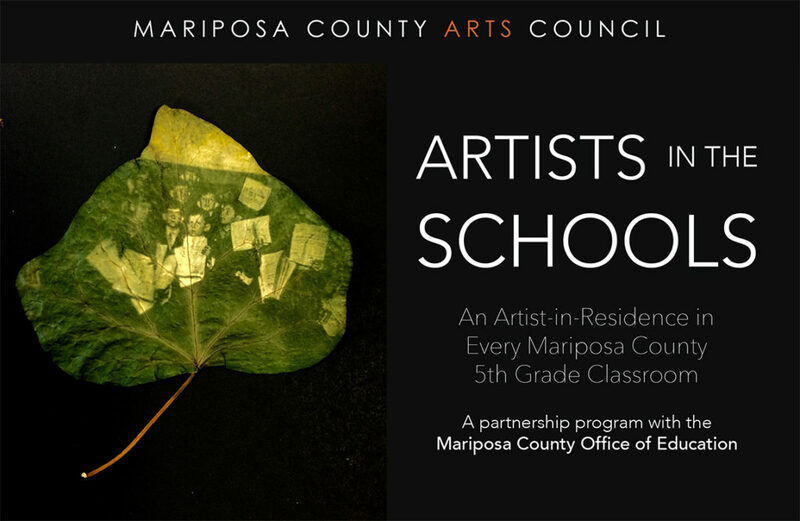 Because we strongly believe that art has the capacity to reach far beyond aesthetics to support rigorous intellectual inquiry, illuminate scientific and mathematical discoveries and concepts, and promote thoughtful conversations about the human condition we are proud of our Artists in the Schools program which taps art’s academic and social potential while building a strong partnership with the Mariposa County Office of Education. El Portal Elementary and Yosemite Valley Elementary: Teaching artist Jackie Baxton and her students at El Portal and Yosemite Valley Elementary School explored three-dimensional artwork by where molding and sculpting models of their own hand, applying lessons about measurements/data, geometry, anatomy/bone structure, and spacial reasoning. Mariposa Elementary: Visual artist Bill Davis and Mariposa Elementary students explored elements of artist process, including the progression of art history, right and left hemisphere flexible thinking, drawing fundamentals, systems of abstraction, and GIF animation and design. Sierra Foothill Charter: Ceramicist Phyllis Becker used her unit, “The Mud Beneath Your Feet,” to examine chemical reactions and the (mathematically measurable) dynamic effects they have on molecular and atomic structure of matter through the creation of whimsical ceramic pieces. Her curriculum was combined with student’s classroom unit on Greek mythology, where students designed and created their own ceramic tile, each based on a Greek myth or character. Woodland Elementary: Students built multimedia art books using paper marbling techniques, watercolors, block prints, threading and more with teaching artist Moira Donohoe. Ms. Donohoe combines multimedia instruction with a broad understanding of the cultural, natural, and historical interdependence of various art forms and encourages individualized creative development within each student. Arts Education – Artists in Schools: The Artists in Schools program supports projects that integrate community arts resources—local artists and non-profit arts organizations—into comprehensive, standards-based arts-learning for PreK-12 students during the school day. Applicants’ projects must take place during regular school hours at the school site, and should address the unique circumstances of the school environment. An article about our 2016 Artists in the Schools program, focusing on the Sierra Foothill Charter School residency with ceramic artists Tiffany Newberry and Phyllis Becker.